This program is also designed to increase their fitness and endurance through enjoyable activities and self rescue techniques. This introductory level is for children ages 6 and up. The main goal of Swim Kids 1 is to increase each student’s confidence in the water. Your child will be encouraged to explore under the water and float and glide on their front and back without assistance. Swim Kids 2 is the level where children learn all of the different components that make up front crawl. Children will learn a series of new skills that challenge the strength of their kicking by adding in arm movement, coordinated breathing, and rolling from their front onto their back. The basic front crawl is the major focus of level 3. In this level, we are encouraging children to build their endurance for a 15 to 25-metre front crawl. Your child will also be practicing entering deep water, supporting themselves at the surface for 20 seconds (treading water) and returning to a point of safety without assistance. The goal of Swim Kids 4 is to further refine the front crawl. Your child will use the skills they have been perfecting to strengthen their stroke. In addition, your child will also spend time working on building their endurance in both Front and Back Crawl strokes.. This is also the level where children enter the Swim Kids levels, after the completion of Whale in the Preschool Program. 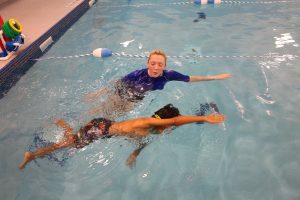 In this challenging level, students are expected to perform a seamless front crawl stroke where they coordinate continuous arms, breathing and kicking at a faster pace than before. Children will also be practicing treading water for 1 minute as a self-rescue skill. In Swim Kids 6, your child will further refine their front and back crawl and will be introduced to a third stroke called elementary back stroke. This level will also challenge your child’s endurance, by increasing the distance to 75 metres! In Swim Kids 7 we begin to develop advanced strokes. Students are taught how to breathe to both sides during front crawl as well as eggbeater. Their endurance is also being put to the test, as the distance has now doubled from Swim Kids 6! At this stage, your child will work on mastering their coordination and timing. Students will learn advanced techniques for front and back crawl. Children will also be introduced to breaststroke and foot first surface dives. In Swim Kids 9 your child will perfect all of the strokes that they have learned. The new skill introduced for this level is head first surface dives. Students will also continue to build their endurance and be able to swim 400 metres by the end of this level. By the end of Swim Kids 10, your child will be steps away from becoming a Lifeguard and they will have perfected all of their strokes. They will also be able to swim 500 metres continuously. On the last day, remember to bring your camera because we have a special cheer for when students pass this level.